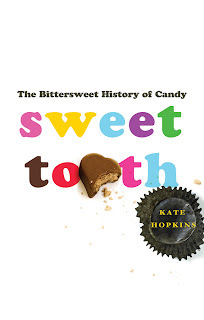 With a name like Sweet Tooth: The Bittersweet History of Candy, and an enticing-looking chocolate on the cover, I couldn't not check this book out of the library. Kate Hopkins is a food blogger (see her website Accidental Hedonist) and she attempts to trace the history of candy while visiting the places where sweets got their origins. Her travels take her to Italy, where delicious torrone was invented (among other treats), Great Britain, the home of "grandma" candy as well as Cadbury's, and to her native US where she visits an early confectionery store in Boston and experiences the childlike heaven of Hershey, Pennsylvania - an entire town devoted to all things candy. As someone who was obsessed with sweets as a child and still gets a bit gushy over the likes of Lindt chocolate and Jelly Bellies, I enjoyed this book very much. It certainly gave me a new appreciation for how candies are made and their long history in Western culture.